Longtable Brioche Burger Buns fresh from the oven. Make more than you think you need -- they freeze well and make really great toast on day two or three. But chances are you won't have the opportunity as they're likely to vanish before you get to pack them up. Its not a secret, I love a good burger (see my June 4, 2016 post for my Lamb Burgers with Olives, Feta and Mint recipe) and summer is nothing if not "burger season". But let's face it, you can do your best work putting together a great patty, top it with amazing condiments and the freshest and most flavorful garnishes and then kill it with a crappy burger bun. There are too many ways to go wrong -- flaccid and flavorless industrial junk that makes you wonder "why?? "; the over-done 'flavored" rolls competing and losing to the good-stuff in-between; the trendy pain au levain rolls -- so crusty and dense that everything slides out if you dare to bite into them... I tend to "wear" my burgers anyway, I don't need that kind of help. Enter the Longtable Brioche Burger Buns! These rolls are everything I want them to be – flavorful and with a moist, flexible crumb that stands up to whatever I might serve on them while also being so easy that I find myself just nodding and smiling at the “OMG’s” they inevitably receive. I love them when I make burgers of all kinds, BLTs, BLTAs, BLTAEs… and I make New England Style Hot Dog Buns out of them since we can’t really get them on the West coast and use them for Bratwurst or Hot-Dogs or Lobster-Rolls (recipe soon) and my favorite spin on the Cubano sandwich (recipe soon), they make for a more than decent Panini and you can sneak a heck of a Grilled-Cheese or Tuna, Chicken or Egg Salad onto a tailgate or picnic plate and rack up the compliments. If you've ever made (non-bread-machine) bread before they're really easy, and even if you've never baked bread it's a pretty great first recipe to try -- even in the unlikely case that you screw up, you'll spend most of the day with your house smelling like fresh bread! They’re best made the morning of, but will keep well for a day or so on the kitchen counter, loosely wrapped in plastic (assuming you can get F&F to keep their hands off. These are a rough adaptation from David Myers and the Light Brioche Burger Bun recipe he and pastry chef Hidefumi Kubota published while at the now (sadly) closed Comme Ça in Los Angeles. Myers has, at least temporarily, been lost to California, as the culinary tides have pulled him to Japan and Southeast Asia. For years, I had many of my favorite meals at his brilliant Sona and enjoyed the inspired yet faithful touch he brought to the more approachable French brasserie fair at Comme Ça. I’ve substituted honey for the original recipe’s sugar as I like the slightly earthier note that bee-sugar brings. And (because I have lactose-intolerant loved ones), I use either goats’ milk or full-fat goat yogurt in place of whole milk – you can sub back as the quantities are otherwise unchanged. NOTE: Bread flour is a must if you can get it – the higher protein content (dreaded gluten) is what gives these their dense/springy/elastic texture. If you can’t get bread flour, use all-purpose and replace ½ cup water with 3 large beaten eggs – it’s not the same but it might get you close. Makes 8 hamburger rolls or 10 medium hot-dog rolls. Doubles or triples very well. 2) In a large mixing bowl, whisk together the 2 ½ cups bread flour, 1/3 cup all-purpose flour and the salt. Add in the butter and using your fingers, rub it into the flour blend until it is very-well distributed, forming “crumbs”. 3) Beat one egg and add to the foamy yeast blend mixing it well before you add the entire liquid mix to the flour and salt in your large bowl. Using a dough scraper, stir and blend the wet and dry ingredients together, regularly scraping down the sides and “cutting” the ingredients together until everything is incorporated into a somewhat-sticky dough. 4) Flour a clean work-surface with a little bread flour and scrape your dough out of the bowl onto it. Knead your dough vigorously for 8-10 minutes (it’s going to feel like a long time!). Scrape the dough up and “slam” it back down or the counter after every 10 or so “kneads” – this really stretchesand tangles the proteins together and is what gives the rolls their beautiful texture. Dust a little more flour as needed, but you want this dough to remain a little tacky – that moisture is what keeps the rolls “tender” when baked. 5) Form dough into a ball and return it to the bowl, cover with plastic wrap and set in a warm place to rise for 1-2 hours until it has doubled in size. 6) Line a baking sheet with a non-stick mat (Silpat) or parchment paper. Gently “punch down” the dough and scrape it out onto your clean, lightly-floured work surface. Divide the dough into 8 even pieces and gently form each piece into a smooth ball. Do this by folding the edges inward and then flipping the dough over and gently rolling it on the work-surface. Place the smooth, shaped dough-balls at least 2-3 inches apart on the baking sheet – the less the rolls touch when fully-risen, the more “perfect” they’ll look. Lightly coat some plastic wrap with cooking spray and leave to rise in a warm place for 1-2 hours until doubled in size again. 7) In preparation for baking, set a shallow baking-pan filled with water on the oven floor and preheat the oven to 400F with a rack in the center. 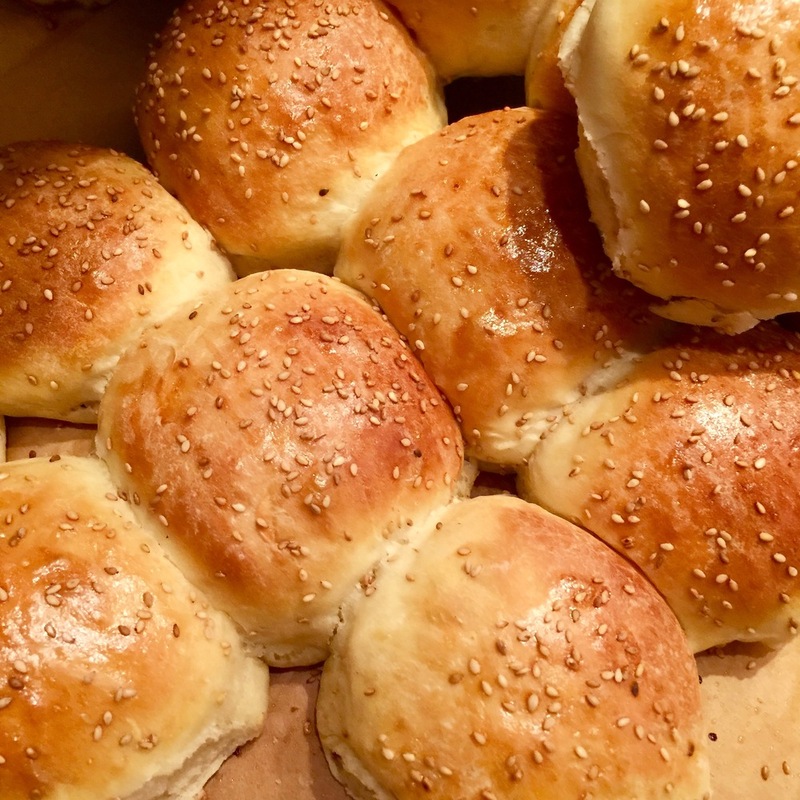 Beat the remaining egg with 1T water and brush the exposed surface of the rolls with the mix, sprinkle with sesame seeds (if using) and a little Kosher or flake salt while still wet. 8) Bake, turning sheet halfway through baking, until tops are golden brown, about 15 minutes. Transfer to a rack to cool completely. Use when cool, store loosely wrapped on the counter for up to a day or refrigerate for a two to three days (bring to room temp or gently warm before serving).